A comfortable and stylish bathroom is a great way to having a relaxing home. In this edition of homify, we concentrate on finding the most impressive bathrooms that will add a sensational and attractive appeal to your modern home. Whether you love the classic and traditional feeling of wood, neutral elegance, cute and quirky or even strict minimalist style, we have a bathroom design to suit you and your character. 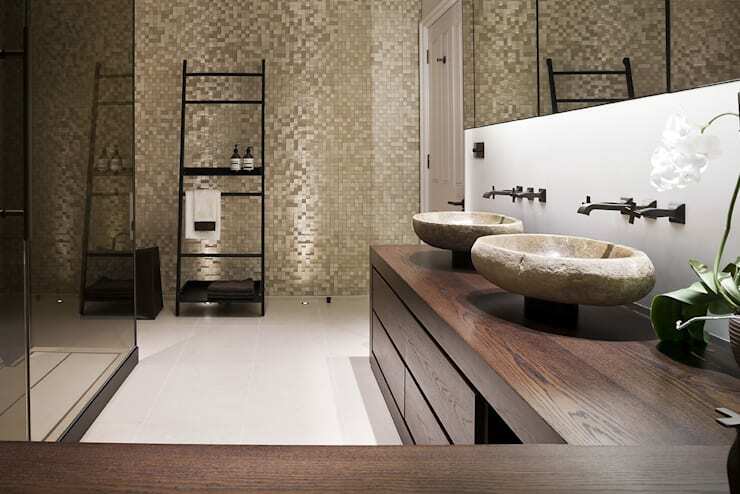 These 10 bathrooms are luxurious, functional and decorated in splendour, so let’s be inspired. This modern bathroom is spacious, bright and elegant. The natural light adds a sensational brightness, while the fixtures, fittings and the rich colour scheme represents opulent design and luxurious living. The strong and fascinating materials creates a comforting effect that is almost regal. This all-white colour scheme is bright and pleasant, with the gorgeous illumination adding some chic design to the bathroom. 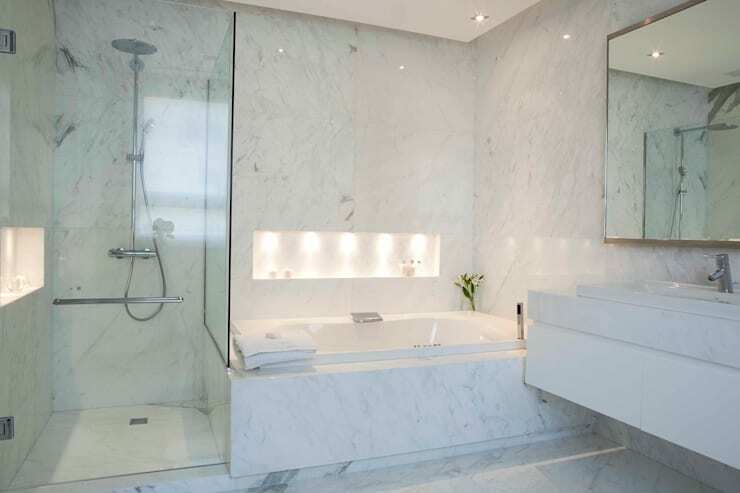 The ceramic walls with the marble design are a definite attractive feature, while the layout of the bathroom is spacious. 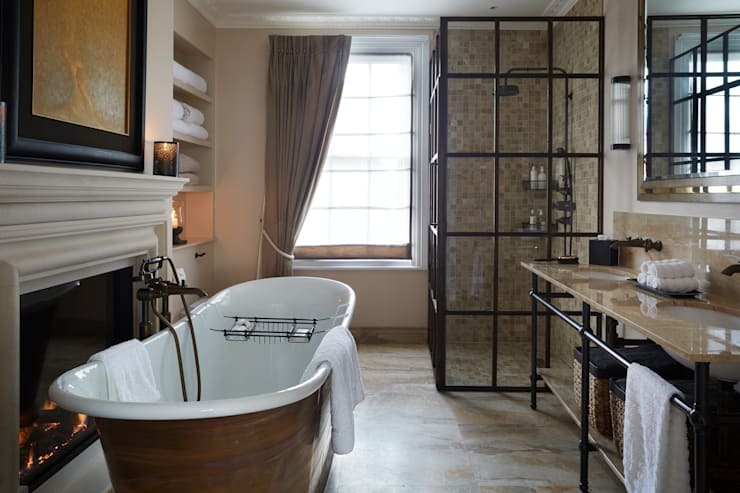 By including both a bath tub and shower into the bathroom, the inhabitants can choose whether to relax in the tub, or be revitalised by the shower. 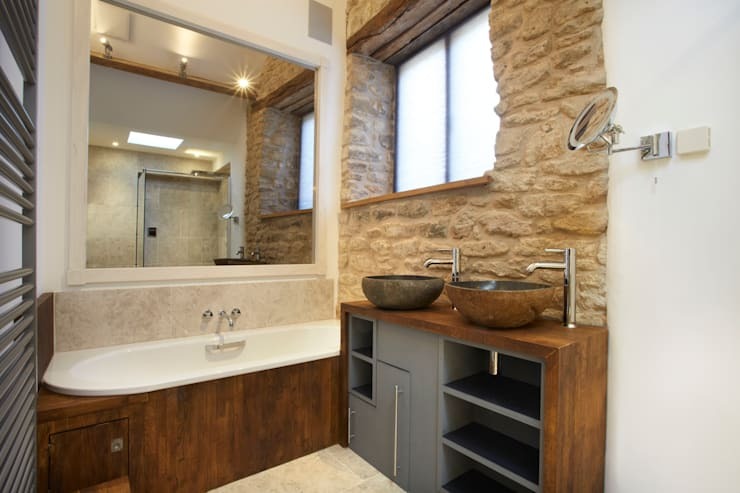 In this image we see the stylish combination of a wooden ceiling and stone walls that makes this bathroom a rustic haven. It’s warm and friendly, while the colour scheme is simple divine too. The bath tub even has a view of the outdoors, now that’s perfectly planned. There is something adorable about being this creative with your bathroom. 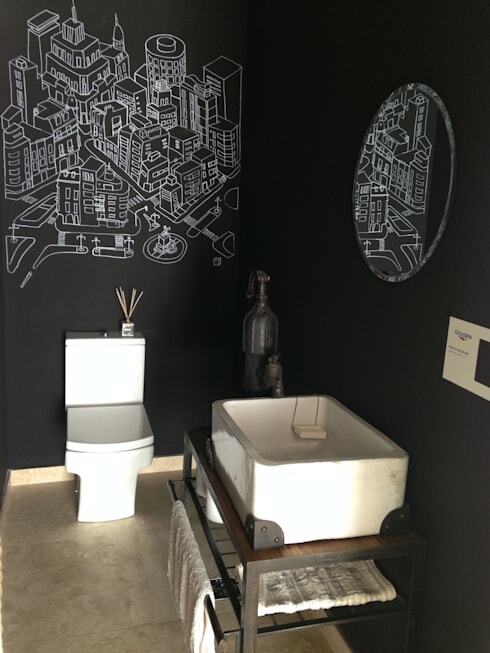 It’s cute and quirky, who wouldn’t want to go ahead and splash some blackboard paint as décor for their bathroom? It’s a fantastic idea if you are looking to revamp the bathroom that your kids use… bath time can now be play time as well. Contact an bathroom designer for more amazing ideas for the kids bathroom. While mosaic may not be the most modern style accent for the bathroom, that doesn’t make it any less dreamy. Opt for this neutral colour mosaic and make your walls and floor feel and look sensational. Now who wouldn’t want this rustic-inspired bathroom in their home? Add some fresh flowers and you’re good to go. 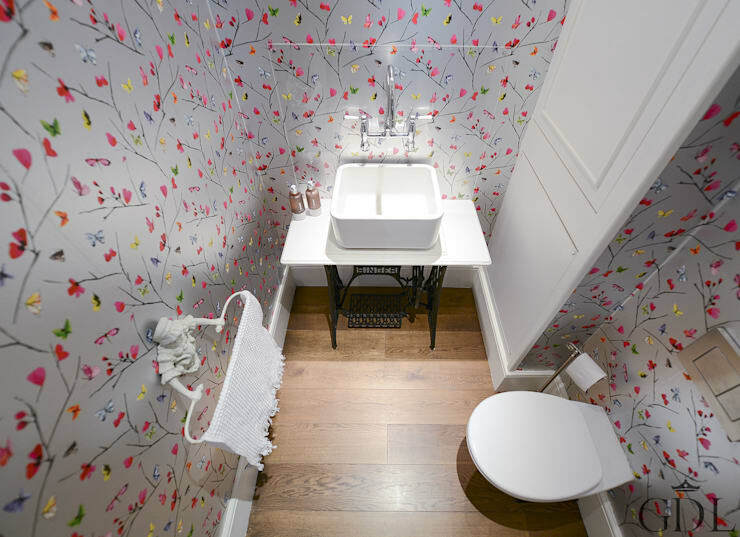 Using wallpaper for your bathroom is fast-becoming a top design choice for homes. But, it’s up to you to be creative with your style option as there are so many styles and designs on the market. Create that fresh look with these cheerful flowers, or perhaps a more luxurious design with some rich colour merged with striking accents. If you love being unique and different, then this copper bath tub is a must for your bathroom. It has an innate traditional style that is beautiful and opulent, while the fireplace adds a warming and luxurious element to the design. 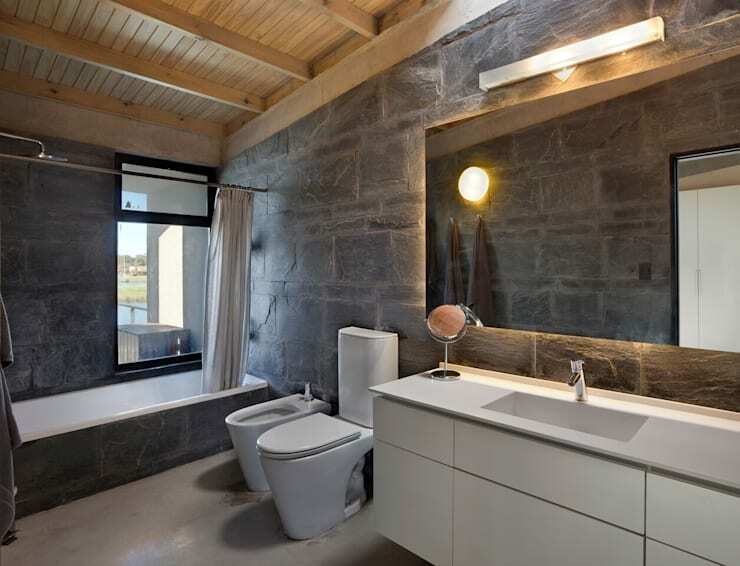 The stone basin in this design is very unusual yet attractive, and along with the minimalist elements, natural wooden counter and mosaic tiles. The clean and uncluttered look is peaceful and tranquil. The bathroom here resembles an old-fashioned French design of simple colours and luxurious detail. The bath tub is located in front of a large fireplace, while the shower is perfectly encased in a glass frame design. The colour scheme is chic and serene too. Are you lucky enough to have exposed rock walls such as these in your home? There’s nothing more extraordinary than utilising the features already available to you to make your bathroom a reflection of your personal taste and respect for quality materials. Need more ideas? 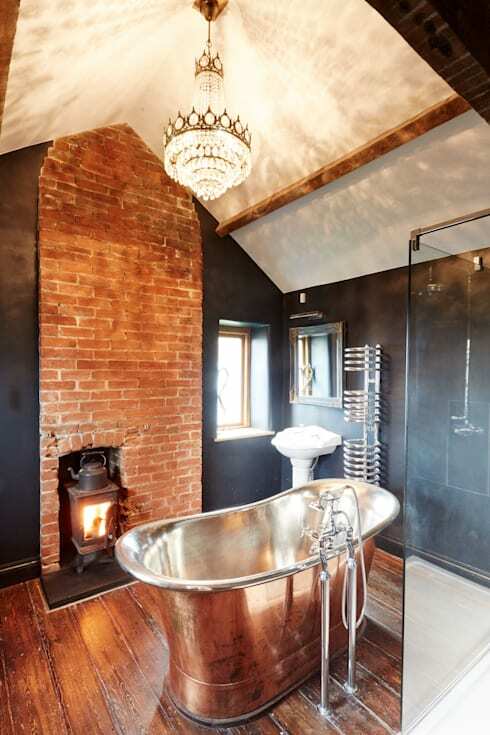 These: 21 spectacular but affordable bathrooms are fantastic! Which bathroom idea would you go with?